1. Held between centers and driven by carries and catch plates. 2. Held on mandrel, which is supported between centers and driven by, carries catch plates. 3. Held and driven by chuck with the other end supported on the tailstock centers. 4. Held and driven by a chuck or a faceplate or an angle plate. 1. Workpiece held between centres. 2. Workpiece held by a chuck or any other fixture. Using a bell centre punch. The work is turned straight when it is made to rotate about the lathe axis, and the tool is fed parallel to the lathe axis the straight turning produces a cylindrical surface by removing excess metal from the workpiece. Roughing cut or rough turning. Finishing cut or finish turning. The rough turning is the process of removal of excess material from the workpiece in a minimum time by applying high rate of feed and heavy depth of cut. The roughing cut should be so made that the machine, the tool, and workpiece can bear the load and it does not make too rough a surface and spoil the center. The depth of cut for roughing operation in average machine shop work is from 2 to 5 mm and the rate of feed is from 0.3 to 1.5 mm per revolution of the work. In fig. Rough turning operation is shown. The finish turning operation requires high cutting speed, small feed, and a very small depth of cut to generate a smooth surface. A finish turning tool having sharp cutting edge is held securely on the tool post for this purpose. In finish turning operation shown in fig. The depth of cut ranges from 0.5 to 1 mm and feed from 0.1 to 0.3 mm per revolution of the workpiece. Once the correct setting is made, the rest is finished by the automatic feed. Copious supply of coolant and lubricant should be used to produces smooth surface. When a work piece having different diameters is turned, the surface forming the step from one diameter to other is called the shoulder, and machining this part of the workpiece is called shoulder turning. The location of the shoulder is first marked on the workpiece by a hermaphrodite caliper, measuring from one end by a steel rule. The first diameter is then turned to the finished size within 0.5 to 1 mm of the shoulder mark. For square or beveled shoulder a right cut facing tool is used to finish up to the shoulder mark. A round nose tool will produce a radius shoulder. An undercut shoulder may be machined by using a parting tool, being fed into the work below the first diameter surface to the desired depth. The amount of taper in a work piece is usually specified by the ratio of difference in diameters of the taper to its length. This is termed as the conicity and its designated by the letter K.
A taper may be turned in a lathe by feeding the tool at an angle to the axis of rotation of the workpiece. The angle formed by the path of the tool with the axis of the workpiece should correspond to the taper angle. 1. By a broads nose from tool. 2. By setting over the tailstock centre. 3. By swiveling the compound rest. 4. By a taper turning attachment. 5. By combining longitudinal and cross feed in a special lathe. A broad nose tool having straight cutting edge is set on to the work at half taper angle and is fed straight into the work to generate a taper surface. In this method the tool angle should be properly checked before use. This method is limited to turn short length of taper only. This is due to the reason that the metal is removing by the entire cutting edge, and any increase in the length of the taper will necessitate the use of a wider cutting edge. In fig. There are shown as method of turning taper by a form tool. The principle of turning taper by this method is to shift the axis of rotation of the workpiece and feeding the tool parallel to the lathe axis. The angle at which the axis of rotation of workpiece is shifted is equal to half angle of taper. This is done when the boly of the tailstock is made to slide on its base towards or away from the operator by a set over screw as illustrated in fig. The amount of set over being limited, this method is suitable small taper on long jobs. Moreover the lathe carrier being set an angle, the angular velocity of the work is not constant. This method employs the principle of turning taper by rotating the workpiece on the lathe axis and feeding the tool at an angle to the axis of rotation of the workpiece. The tool mounted on the compound rest is attached to a circular base, graduated in degree, which may be swiveling and clamped at any desired angle. This is shown in fig. This method is limited to turn a short taper owing to the limited movement of the compound rest. The compound rest may be swiveled at 45º on either side of the lathe axis enabling it to turn a steep taper. The movement of the tool in this method being purely controlled by hand, this gives a low production capacity and poorer surface finish. 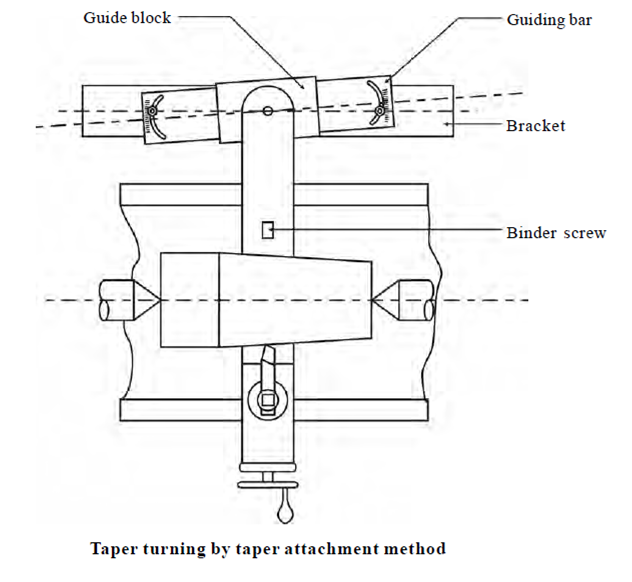 The principle of taper turning taper by a taper attachment is to guide the tool in a straight path set at an angle to the axis of rotation of the workpiece, while the work is being revolved between centres or by a chuck aligned to the lathe axis. A taper turning attachment is shown in fig. When the taper turning attachment is used, the crosslide is first made free from the lead screw by removing the binder screw. The rear end of the crosslide is then tightened which the guide block by means of a bolt. The required depth of cut is given by the compound slide, which is placed at right angle to the lathe axis. The guide bar must be set at half taper angle and the taper on the must be converted in degrees. The maximum angle through which the guide bar may be swivelled is 10º to 12º on either side of the centre line. This is a more specialized method in which certain lathes both longitudinal and cross feeds may be simultaneously causing the tool to follow a diagonal path which is the resultant of the magnitude of the two feeds. Varying the rate of feeds by change gears provided inside the apron may change the direction of the resultant. Taper turning by combining feeds is shown in fig. If a cylindrical workpiece has two separate axis of rotation one being out of center to the other the workpiece is termed eccentric and turning of different surfaces of the workpiece is known as eccentric turning which is shown in fig. The shaft is first mounted on its true center and the part forming the journal is turned. The job is then remounted on the offset center and the eccentric surfaces are machined. In eccentric turning, counterbalance weights are mounted on the face plate to get uniform turning movement. Chamfering, is shown in fig., is the operation on beveling the extreme end of a workpiece. This is done to remove the burrs, the protect the end of the workpiece from being damaged and to have a better look. The operation may be performed after knurling, rough turning, boring, drilling or thread cutting. 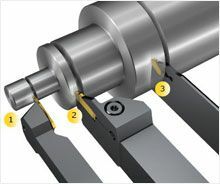 Chamfering is an essential operation after thread cutting so that the nut may be pass freely on the threaded workpiece. Thread cutting is one of the most important operations performed in a lathe. The principle of thread cutting is to produce a helical groove on a cylindrical or conical surface by feeding the tool longitudinally when the job is revolved between the centers or by a chuck. The longitudinally feed should be equal to the pitch of thread to be cut per revolution of the workpiece. The leadscrew of the lathe, through which the saddle receives its traversing motion, has a definite pitch. A definite ratio between the longitudinal feed and rotation of the headstock spindle should therefore be found out so that the relative speed of rotation of the work and the leadscrew will result in the cutting of a screw of the desired pitch. Change gears arranged between the spindle and the leadscrew or by the change gear mechanism or feed box used in a modern lathe where it provides a wider range of feed and the speed ratio can be easily and quickly changed affect this. Fig illustrates the principle of thread cutting. Facing is the operation of machining the ends of a piece of work to produce a flate surface square with the axis. The operation involves feeding the tool perpendicular the axis of rotation of the workpiece. A properly ground facing tool is mounted in a tool holder in a tool post. The cutting edge should be set at the same height as the center of the workpiece. Knurling is the process of embossing a diamond shaped pattern on the surface of a workpiece. The purpose of knurling is to provide an effective gripping surface on a workpiece to prevent it from slipping when operated by hand. In some press fit work knurling is done to increase the diameter of a shaft. The operation is performed by a special knurling tool which consists of 1 set of hardened steel rollers in a holder with the teeth cut on their surface in a definite pattern. Fig., illustrates a revolving holder with three sets of knurls. Any one set or pair may be brought into operation by revolving the unit. Filing is the finishing operation performed after turning. This is done in a lathe to remove burrs, sharp corners and feed marks on a workpiece and also to bring its size by removing very small metal. The operations consist of passing a flate single cut file over the workpiece at high speed. Polishing is performed after filling to improve the surface quality of the workpiece. Polishing with successively finer grades of emery clothe after filing result in very smooth, bright surface. The lathe is run at high speed from 1500 to 1800 m per min, and oil is used on the emery cloth. Grooving is the process of reducing the diameter of a workpiece over a very narrow surface. It is done at end of the thread to a shoulder to leave a small margin. The work is revolved at half the speed of turning and a grooving tool of required shape into the work by rotating the cross-slide screw. A grooving tool is similar to a parting of tool. This is shown in fig. 1. Using a forming tool. 2. Combining cross-land longitudinal feed. 3. Tracing or coping a template. For turning a small surface, forming tool having cutting edge conforming to the shape required is fed straight into the work. Forming tools are used mainly for finishing formed surfaces. Usually two types of forming tools are used – Straight and Circular. Straight type is used for wider surface and the circular type for narrower surfaces fig. shown forming operation performed by straight or Circular tools. The cross feed ranges from 0.01 to 0.08 mm per rev. When the length of the formed surface is sufficiently grate, the required shape may be obtain by using straight turning tool. The process is tedious and requires much skill. Drilling is the operation of producing a cylindrical hole by the rotating cutting a edge of a cutter known as the drill. 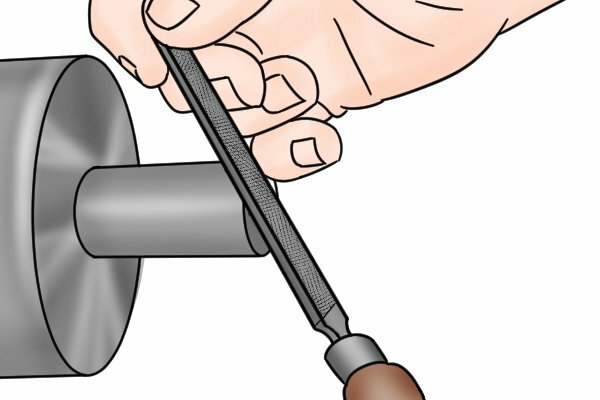 There are two methods to drilling in a lathe. 1. The workpiece is revolved in a chuck and the drill is held in the drill holder. The movement of the tailstock spindle effects feeding. 2. The drill is held and driven by a drill chuck attached to the headstock spindle. The movement of the tailstock spindle effects feeding. When workpiece is in irregular shape, which cannot be accommodated on a chuck. Speeds and feeds for drilling in a lathe are 25% lower than the corresponding figures for drilling in a drilling machine. Reaming is the operation of finishing and sizing a hole, which has been previously drilled or bored. The tool used is called the reamer, which has multiple cutting edges. The reamer is held on the tailstock spindle, either direct or through a drill chucks and is held stationary while the work is revolved at a very slow speed. The feed varies from 0.5 to 2 mm per revolution. Boring is the operation of enlarging and truing a hole producing by drilling, punching, casting or forging. Boring cannot originate a hole. 1. The work is revolved in a chuck or a faceplate and the tool, which is fitted to the tool post, is fed into the work. 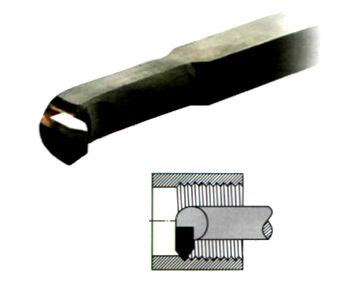 One piece-forged tool is used for boring small hole, whereas a boring bar with a tool bit attached to it is suitable for machining a large hole. The depth of cut is given by the Crosslide screw and the feed is effected by the longitudinal travel of the carriage. 2. The work is clamped on the carriage and a boring bar holding the tool is supported between the centers and made to revolve. In fig. Shown a operation of boring bar. The principle of cutting internal thread shown in fig. Similar to an external thread, difference being in the tool used. The tool is similar to boring tool with cutting edges ground to the shape conforming to the thread to be cut. For cutting metric thread, the compound slide is swiveled 30º towards the headstock. 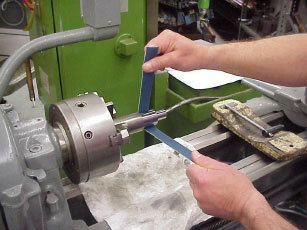 The tool is fixed on the tool post after setting it at right angle, using a thread gauge. The depth of cut is given by the compound slide and the thread is finished in the usual manner. Undercutting is shown in fig., similar to grooving operation. It is the process of boring a groove or a large hole at fixed distance from the end of a hole, except that a square nose-parting tool is used. Undercutting is done at the end of an internal thread or a counterbore to provide Clearance for the tool or any mating parts. In fig parting-off, the operation of cutting workpiece after it has been machined to the desired size and shape. The process involves rotating the workpiece on a chuck at half the speed by narrow parting of tool perpendicular to the lathe axis. Before the operation is started, the carriage is locked in a position on the lathe bed and the cutting tool is held rigidly on the tool post with the compound slide set parallel to the lathe axis. The feed varies from 0.07 to 0.15 mm per rev. and the depth of cut tool ranges from 3-to10 mm. In stages the parting tool is first fed through a certain depth, two more cuts are made at the two slides of the central groove. ← To study different Types of Lathe machine and basic parts of Engine Lathe.